Recently, a 15-year-old boy survived as a stowaway in a wheel well during a 5-hour flight from California to Hawaii, despite being exposed to subzero temperatures and oxygen depletion. Here are 10 other recent inspirational cases of improbable survival based on a review of published scientific data. These cases show that one should never give up no matter what the diagnosis is. Be sure to send this to any friends or family with serious medical problems for inspiration. The numbers of the references below correspond to the numbers of the cases cited. Links to the free articles are provided when available. 1. BREAST CANCER: A 55-year-old woman with recurrent breast cancer survived long-term (about 5 years) after developing abnormal fluid and pressure buildup around the heart due to inflammation of the sac-like covering around the heart, which was caused by the spread of cancer cells there. Such long-term survival is usually rare. A surgical procedure that created an opening to drain the fluid around the heart likely helped extend her life. 2. MENINGITIS: A 6-year-old boy survived a battle with a rare and more than 95% fatal form of meningitis caused by an amoeba (Naegleria fowleri ). He received immediate treatment, which is believed to central to saving his life. He was discharged home in 3 weeks. 3. MALE REPRODUCTIVE CANCER: A 45-year-old man survived a rare form of blood vessel cancer in the reproductive system after receiving chemotherapy, radiation, and surgery. He has been cancer-free for 6 years since therapy ended, the longest ever reported. The multi-modal therapy was considered to be a factor in his survival. 4. STOMACH CANCER: An 84-year-old man with advanced stomach cancer that spread to the liver and lymph nodes achieved long-term progression-free survival with a new individualized treatment approach: use of Avastin (which slows the growth of new blood vessels that feed tumors) combined with low-dose S-1 (chemotherapy). 5. NO LIVER FUNCTION: A 66-year-old man survived after 66 hours (odd coincidence) of no liver functioning due to severe bleeding complications during a liver transplant while awaiting a second suitable donor organ. There were no known neurological complications, which is also unusual. 6. INTESTINAL CANCER: A 45-year-old man with a rare form of recurrent cancer of the small intestine has been disease free after 8 years following surgery and multiple forms of chemotherapy. 7. MULTIPLE ORGAN SYSTEM DYSFUNCTION (MODS): A 55-year-old man is the oldest man known to survive MODS, which is the leading cause of death in intensive care units. Prognostic indicators indicated certain death in his case yet he survived, recovering almost all organ function after 6 weeks. He had developed MODS after suffering a stroke. 8. THYMUS CANCER: A 73-year-old man with a rare form of cancer of the thymus obtained long-term (greater than 4 years) of progression free survival and good quality of life. The thymus is an organ located in the upper part of the chest and is very important in producing substances that protect the body against disease. 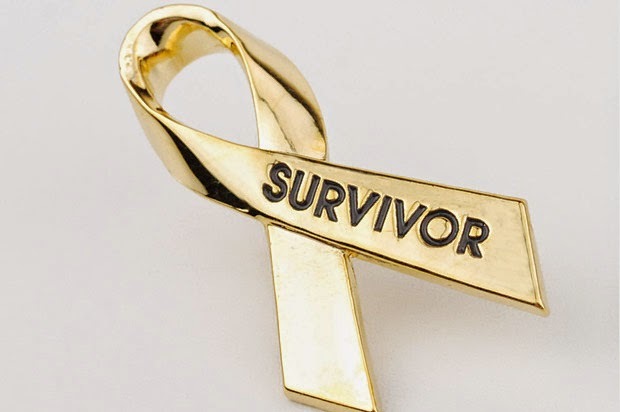 The patient achieved his long-term survival after treatment with S-1 when first-line chemotherapy and radiation failed. 9. MULTIPLE BRAIN TUMORS: A 51-year-old woman survived for three years after developing two different types of brain tumors at once: glioblastoma and meningioma. This is the first known case of its kind to have survived this long. 10. HEART ATTACK AND HYPOTHERMIA: A 65-year-old woman survived without any problems after suffering a heart attack from deep accidental hypothermia. 1. Ikeda H, Kikawa Y, Nakamoto Y, Takeo M, Yamamoto M. (2013). A patient with recurrent breast cancer showing long-term survival after developing pericardial effusion and cardiac tamponade caused by carcinomatous pericarditis. Breast Care (Basel). 8(1):71-3. Free article here. 2. Sood A, Chauhan S, Chandel L, Jaryal SC. (2014). Prompt diagnosis and extraordinary survival from Naegleria fowleri meningitis: A rare case report. Indian J Med Microbiol. 32(2):193-6. Free article here. 3. Chang K, Sio TT, Chandan VS, Iott MJ, Hallemeier CL. (2014). Angiosarcoma of the seminal vesicle: a case report of long-term survival following multimodality therapy.Rare Tumors.6(1):5202. Free article here. 4. Fang J, Wang H, Xu Q. (2013). Bevacizumab combined with low-dose S-1 as maintenance therapy with a long progression-free survival in an elderly patient with heavily pre-treated advanced gastric cancer: A case report. Biomed Rep. (2):239-242. Free article here. 5. Photi E, Crawford M, Pulitano C. (2014). Long-term survival after 66 hours of anhepatic time with no neurological deficit. Ann Transplant. 19:93-5. 6. Nagaraj G, Zarbalian Y, Flora K, Tan BR Jr. (2014). Complete response and prolonged disease-free survival in a patient with recurrent duodenal adenocarcinoma treated with bevacizumab plus FOLFOX6. J Gastrointest Oncol. 5(1):E1-6. Free article here. 7. Kleiman DA, Barie PS. (2014). Survival in Fully Manifest Multiple Organ Dysfunction Syndrome. Surg Infect (Larchmt). (epub). 8. Tanaka H, Morimoto T, Taima K, Tanaka Y, Nakamura K, Hayashi A, Kurose A, Okumura K, Takanashi S. (2013). The long-term survival of a thymic carcinoma patient treated with S-1: a case report and literature review. Onco Targets Ther. (2013). 7:87-90. Free article here. 9. Linhares P, Martinho O, Carvalho B, Castro L, Lopes JM, Vaz R, Reis RM. (2013). Analysis of a synchronous gliosarcoma and meningioma with long survival: A case report and review of the literature. Surg Neurol Int. 4:151. 10. Meyer M, Pelurson N, Khabiri E, Siegenthaler N, Walpoth BH. (2014). Sequela-free long-term survival of a 65-year-old woman after 8 hours and 40 minutes of cardiac arrest from deep accidental hypothermia.(2014). J Thorac Cardiovasc Surg. 147(1):e1-2. Below is a summary of 10 of the most recent scientific findings on weight loss. The numbered references at the end correspond to the numbered sections below. Links to free versions of the full articles are provided when available if you are interested in reading more. 1. 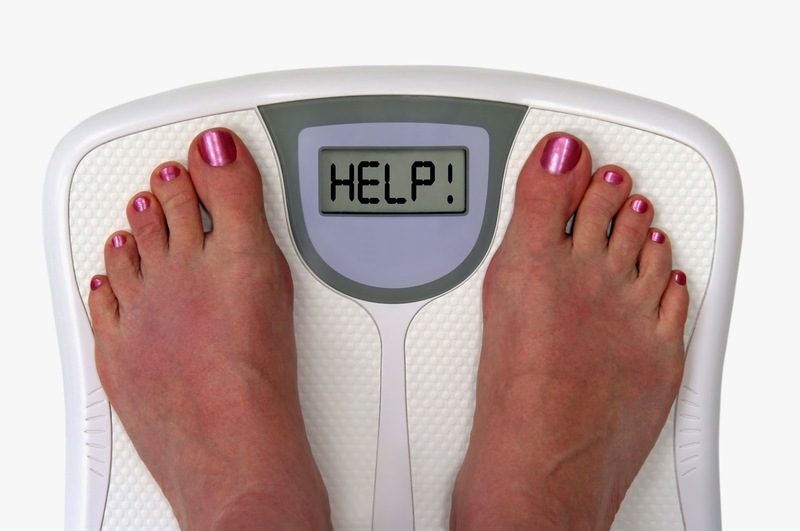 Barriers and Help for Women: The two main barriers of weight loss include a) struggling with self such as poor self-control, insecurity, health problems, and difficulties changing food habits and b) problems implementing a diet. Self-determination (which was associated with having clear goals) and social support from friends and family helped achieve weight loss. 2. Telephone support: People who received 4 telephone wellness coaching calls and completed a weight loss program reported losing three pounds. This was more weight loss than people who were not targeted for wellness coaching and people who did not complete a weight loss program. Telephone support appeared to provide a small weight loss benefit but reliance on self-reported weight is a limitation of the study. 3. Predictors of Weight Loss Maintenance: Based on a survey of 450 people, the best weight loss maintenance predictors were weekly weighing, decreased evening snacking, decreased portion size, and being physically active each day. 4. Psychological Problems: In 138 obese women, 77% had symptoms of anxiety, 61% had moderate to major depression symptoms, and half had low assertiveness. The prevalence of these problems increased with the degree of eating disorders. Feelings of ineffectiveness were common among the women’s psychological profiles. 5. Zonisamide: A case study of an obese adolescent showed that when treated with Zonisamide, weight loss decreased from 279.5 pounds to 234 pounds, a 16.25% reduction. The authors discuss the possibility of using this medication, which is normally used to treat seizures, for weight loss in adolescents. Clinical trials are ongoing to study this medication for weight loss. 6. Effects on Offspring: Dietary interventions are important during pregnancy because maternal obesity has long-term consequences for the offspring’s ability to metabolize of lipids (fats) in the liver. 7. Benefits of Lap Bands: The first 10% weight loss from the lap band procedure, which involves partial clamping of part of the stomach to slow down food consumption, is associated with improved kidney function, metabolism, blood flow, and sympathetic nervous system functioning. The sympathetic nervous system is the part of the nervous system that generally excites the body by doing things such as increasing both the heart rate and blood pressure. 8. Urinary problems: Weight loss in obese women helps reduce episodes or urinary incontinence, urine leakage, and quality of life. 9. Benefits of a Revised Gastric Bypass Surgery: A revised gastric bypass surgery that is performed after the first failed or when converting stomach stapling to a gastric bypass surgery provides less weight loss and more health complications compared to if gastric bypass surgery was performed initially and was successful. However, the revised gastric bypass surgery provides an excellent opportunity to reduce other diseases related to obesity. 10. Low Intensity Weight Loss Programs: Even low intensity weight loss programs in the workplace can lead to clinically significant weight loss (5 or more % of body weight) in a significant number of participants. Weight tracking tools through a website were most predictive of weight loss. Other helpful weight loss predictors were eating more fruits and vegetables, increased physical activity, and reducing stress. 1. Hammarström A, Wiklund AF, Lindahl B, Larsson C, Ahlgren C. (2014). Experiences of barriers and facilitators to weight-loss in a diet intervention - a qualitative study of women in Northern Sweden. BMC Womens Health.14(1):59. 2. Tao M, Rangarajan K, Paustian ML, Wasilevich EA, El Reda DK. (2014). Dialing in: effect of telephonic wellness coaching on weight loss. Am J Manag Care. 20(2):e35-42. 3. Abildso CG, Schmid O, Byrd M, Zizzi S, Quartiroli A, Fitzpatrick SJ. (2014). Predictors of Weight Loss Maintenance following an Insurance-Sponsored Weight Management Program. J Obes. FREE article here. 4. Panchaud Cornut M, Szymanski J, Marques-Vidal P, Giusti V. (2014). Identification of psychological dysfunctions and eating disorders in obese women seeking weight loss: cross-sectional study. Int J Endocrinol. FREE article here. 5. Nguyen ML, Pirzada MH, Shapiro MA. (2013). Zonisamide for weight loss in adolescents. J Pediatr Pharmacol Ther. 2013 Oct;18(4):311-4. FREE article here. 6. Nicholas LM, Rattanatray L, Morrison JL, Kleemann DO, Walker SK, Zhang S, Maclaughlin S, McMillen IC. (2014). Maternal obesity or weight loss around conception impacts hepatic fatty acid metabolism in the offspring. Obesity (Silver Spring). 7. Lambert EA, Rice T, Eikelis N, Straznicky NE, Lambert GW, Head GA, Hensman C, Schlaich MP, Dixon JB. (2014). Sympathetic Activity and Markers of Cardiovascular Risk in Nondiabetic Severely Obese Patients: The Effect of the Initial 10% Weight Loss. Am J Hypertens. (epub ahead of print). 8. Gozukara YM, Akalan G, Tok EC, Aytan H, Ertunc D. (2014). The improvement in pelvic floor symptoms with weight loss in obese women does not correlate with the changes in pelvic anatomy. Int Urogynecol J. (epub ahead of print). 9. McKenna D, Selzer D, Burchett M, Choi J, Mattar SG. (2014). Revisional bariatric surgery is more effective for improving obesity-related co-morbidities than it is for reinducing major weight loss. Surg Obes Relat Dis. (epub ahead of print). 10. Carpenter KM, Lovejoy JC, Lange JM, Hapgood JE, Zbikowski SM. (2014). Outcomes and utilization of a low intensity workplace weight loss program. J Obes. FREE article here. 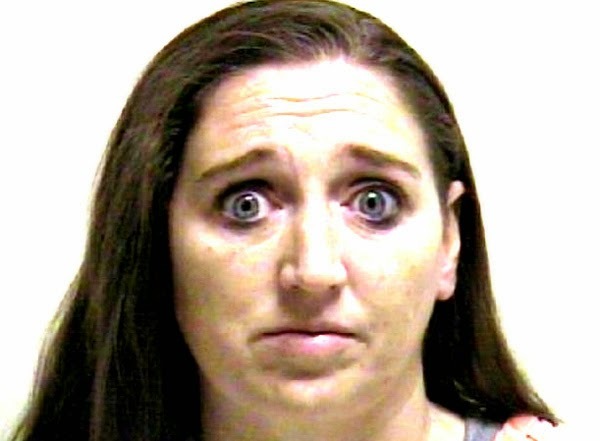 On April 13, 2014, Megan Huntsman from Utah was arrested after admitting to killing 6 newborns, placing them in plastic bags, and storing them in boxes inside her garage. This occurred over a 10-year period from 1996 to 2006. Her estranged husband made the discovery the day prior to her arrest after cleaning out the garage and noticing a strange package with a strong and foul odor. Police then discovered other dead infants that were allegedly strangled or suffocated. One infant, a seventh, was reportedly a stillborn. The murder of infants (known as infanticide), neonatocide (killing an infant within 24 hours after birth), and/or filicide (a parent killing their own child) are some of the most reviled crimes in society. It naturally leads most people to ask how and why someone can do such a thing. In Hunstsman’s case, the answer could not be that she did not have a safe way to get rid of children she did not want because Utah has a Safe Haven law that allows infants that parents do not want to be dropped off anonymously at a hospital without any legal consequences. The following is 10 facts about infanticide based on a recent scientific review of the literature (reference below). 1. STATISTICS: The killing of infants and newborns is one of the most common forms of murder by women. In industrialized countries, for every 100,000 infants, 2.4 to 7 are murdered. The true incidence is likely under-reported because the existence of some deceased babies is unknown until the bodies are discovered. Up to 10% of sudden infant death syndrome (SIDS) cases are actually undetected homicides. Most murdered infants and newborns are killed by the biological mother. 2. DIFFERENT CHARACTERISTICS: Women who murder newborns tend to be younger than age 25, single, live with their parents, unemployed or attending school, do not seek prenatal care, and are no longer involved with the child’s father. Women who murder infants older than one day of age tend to be older than 25, are often married, well-educated, and commit the crime as a form of retaliation (e.g., against an abusive spouse). 3. MENTAL ILLNESS: Many to most women who kill infants are not formally designated as mentally ill. Other factors associated with infanticide besides illness include less education (e.g., dropping out of school), anger, youth of the mother, and not wanting to invest personal time in child rearing. Personality styles and hormone levels have not been found to differ between women committing infanticide and those who did not vomit infanticide. Psychosis (detachment from reality) and clinical depression is rare in mothers who commit infanticide, although some mild emotional disruption may be present. 5. SYMBOLISM: The infant victim is typically viewed by the mother as an object rather than as an independent living person. 6. CAUSE OF DEATH: Most women use their hands in the murder (e.g., suffocation, drowning, strangulation) instead of using external weapons. 7. GENDER OF VICTIM: Most murdered infants are male in Western nations whereas in some Eastern countries (e.g., India, China) most murdered infants are female. The male preference in Western cultures may be because the male is more symbolic of the female’s reproductive partner. (In Eastern countries it may be because females are viewed as less desirable). 8. CONCEALMENT: As in the Huntsman case, most cases of infanticide involve the mother trying to conceal it in some way (e.g., placing in garbage cans, refuse sites). This is similar to the Hunstsman case, with the infants stored in boxes in a garage. In neonaticide cases, the mother typically tries to make the pregnancy and birth a secret. 9. RECIDIVISM: The rate of recidivism of infanticide is unknown but there have been other cases of repeated infanticide, as high as eight. In some of these cases, the deaths had previously been attributed to Sudden Infant Death Syndrome. 10. PRIOR ARRESTS: Most women who murder infants do not have a prior arrest record. Reference: Porter and Gavin (2010). Infanticide and neonaticide: a review of 40 years of research literature on incidence and causes. Trauma Violence Abuse. 11(3):99-112. Here's a shocking fact. One of the most important elements of a doctor's lifesaving decision making process has absolutely nothing to do with medicine. It has to do with logistics. Medical testing takes on many forms. Blood tests are what immediately spring to mind for most of us. You go to your doctor because you are having symptoms of a high fever and chills. The doctor suspects some type of infection. She orders a blood culture that will detect bacterial and fungal germs in the blood. What happens next is not medicine, but logistics. The samples she ordered has to be sent off to a lab for testing. The proper handling and transport of those samples could make all the difference in the quality of your treatment. Get the cryo-preservation a little bit wrong, and the lab does not have a usable sample for an accurate reading on which your doctor can base a proper diagnosis. New technology advances cancer detection through blood testing. One of the big challenges of cancer research is the ability to isolate CTCs. Circulating tumor cells are rare and difficult to categorize. New technologies have made it possible to address cancers of epithelial origin: prostate, breast and colorectal. 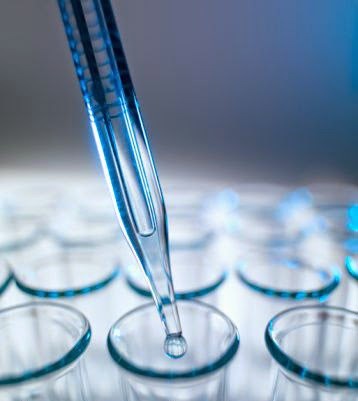 There is reason to believe that more effective treatments are within our grasp thanks to advances in medical testing. Future devices may eliminate the need for invasive glucose monitoring. In the span of a single lifetime, we have already seen diabetes go from a death sentence with inevitable complications, to a manageable condition that does not have to hinder or shorten a normal life. For many, the most inconvenient part of having diabetes is the finger pricking necessary for frequent glucose monitoring. Today, we can test glucose with a tiny implant under the skin that sends information to an external device. Currently, it does not replace the finger prick entirely. But it will in time, just as the finger prick replaced urine samples. Though current technology has not yet caught up to the vision, researchers are looking to wrist-worn devices to perform the task of persistent glucose monitoring. It is rumored in some quarters that Apple is working on such a feature in its upcoming iWatch wearable. There are new methods of detecting heart disease. Right now, heart disease is the number one killer. We are devoting a great deal of research to push it down in the rankings. One of the best ways to do that is detecting it early enough to do something about it. One of the newer tests is engineered to detect the presence of cardiac troponins which are only found in the heart. Another more recent test helps to diagnose patients who present with chest pain. It can more accurately determine if a heart attack has occurred. By using these and other advanced methods, we are able to greatly reduce the damage cause by heart disease. 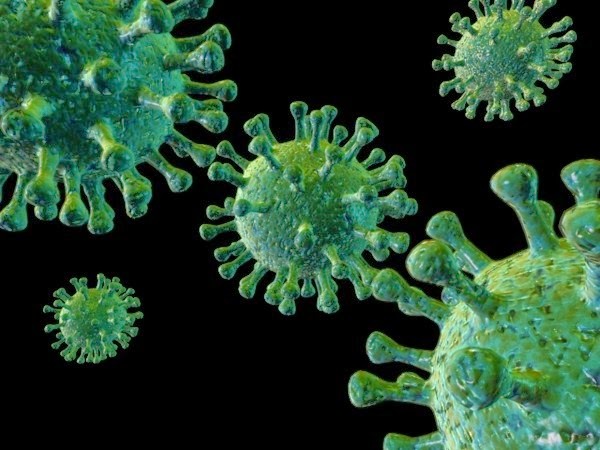 Many people have heard of the deadly viruses, bacteria, and parasites shown below, but have you ever seen what they look like? Below is a collection of images depicting the microbial monsters. Which one do you think looks the most frightening? 10. Severe acute respiratory syndrome (SARS): SARS is a potentially deadly and highly contagious viral syndrome. It led to an outbreak in China that killed nearly 1000 people. 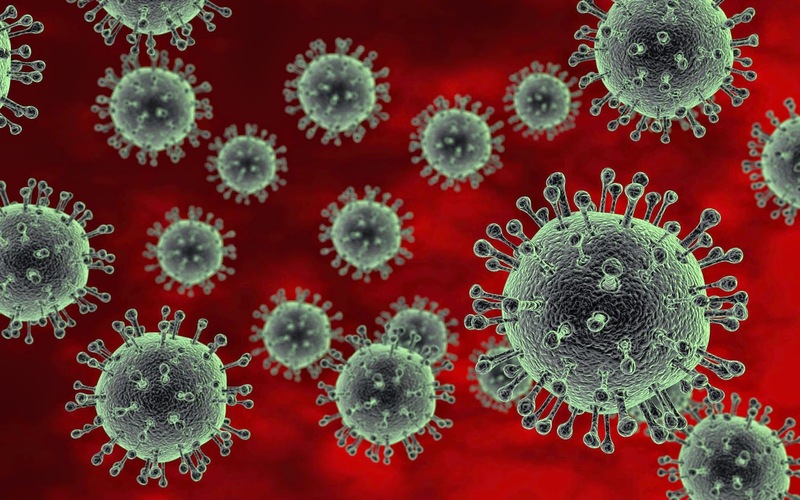 The virus causing SARS (known as the SARS coronavirus) is pictured. 9. Typhoid fever: Typhoid fever is a bacterial disease that typically affects the intestines. However, it can affect the lungs in some case with no signs of intestinal damage. 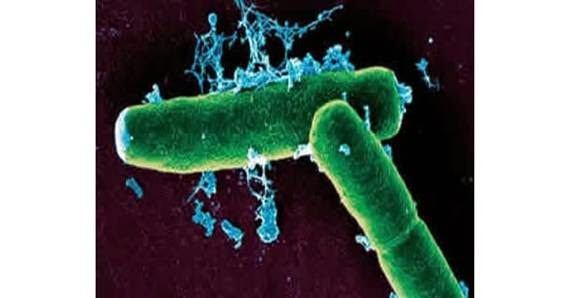 It is transmitted by ingesting food or water containing the feces of the infected person which contains the bacteria, Salmonella enterica enterica (pictured). 8.Yellow fever: This is a viral disease that can cause liver damage resulting in yellow skin. 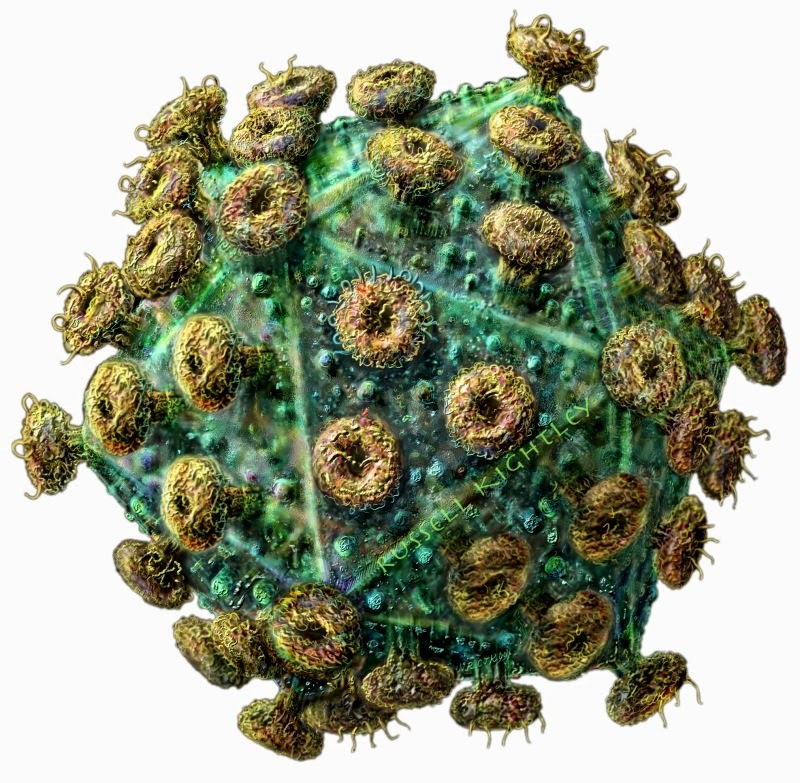 It is caused by a virus (a type of Flavivirus; pictured) transmitted by mosquitoes. There is no cure. 7. 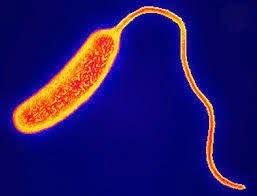 Cholera: This is an infection of the small intestine caused by the bacteria Vibrio cholerae (pictured). It is known to cause diarrhea, vomiting, dehydration, and gray-blue skin. It is spread by coming in contact with water or food contaminated by the bacteria. If untreaded, 50 to 60% of people infected with it, will die. 6. Malaria: Malaria is a serious disease caused by parasites that is spread by mosquitoes. 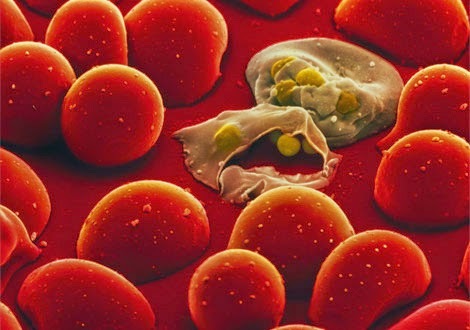 This picture shows healthy red blood cells surrounding red blood cells (pale color) that are being attacked by malaria parasites. 5. Bird Flu (Avian Flu): This is a type of flu that has adapted to birds but which can adapt to infect different species, including humans. A picture of the bird flu virus is shown. 4. 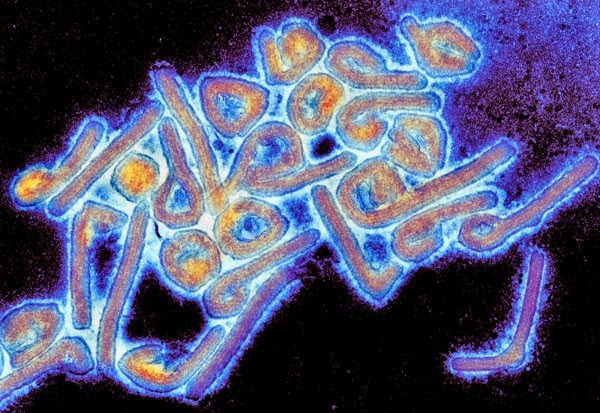 Marburg virus: This is a virus (pictured) that causes fever and bleeding disorders. In many cases, it leads to shock and death, which is why it is considered a severe disease in humans. It is named after the city of Marburg, Germany, where the virus was first identified during an outbreak in the 1960s. 3. 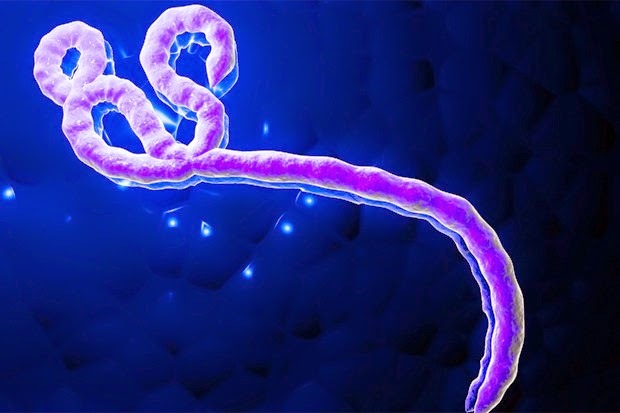 Ebola virus: This is a very dangerous virus (pictured) that causes severe disease in humans and other primates. It is named after the Ebola River in the Republic of Congo where the first recorded ebola virus took place. 2. Human Immunodeficiency virus (HIV): HIV is a virus that attacks the body’s immune system, leading to infections and harmful tumors. AIDS is a decrease in the effectiveness of the body's immune system that is due to HIV infection. 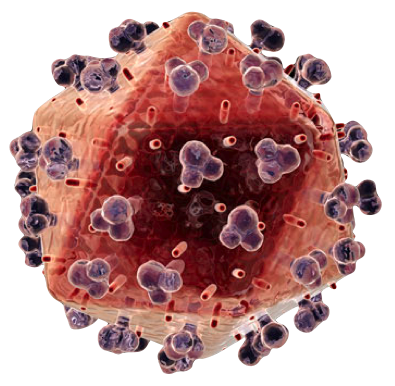 An HIV virus particle is shown in the picture. 1. Bacillus anthracis: This is the bacteria known to cause anthrax, a type of biological infection. Signs and symptoms of anthrax infection typically begin one to five days after being exposed to anthrax spores, but can take as long as sixty days to appear. A spore is a form of bacteria that is resistant to heat, drying, and chemicals. The picture above shows anthrax spores. It is important to note the big difference between being exposed to anthrax and being infected with it. Exposure to anthrax only means that one has come in contact with the bacteria. Not everybody who is exposed to anthrax becomes infected, although some do. Anthrax infection means that the anthrax spores have invaded the body and are multiplying, causing various signs and symptoms. On 4/8/14, 16-year-old Alex Hribal is alleged to have stabbed 21 people in school with kitchen knives in Murrysville Pennsylvania. As of now, not much is known about Hribal’s past except that he has been described as a loner by some peers (although his attorney denies this). As it turns out, however, this is the main characteristic of adolescent mass murderers. Peers who have been interviewed to date have said they are unaware of Hribal being bullied. Law enforcement officials have said that his social media presence was minimal and that he does not appear to have owned a cell phone. When events like this occur, especially when they lead to murder, people naturally try to understand why. What follows are 10 characteristics of 34 male adolescent (ages 11 to 19) mass murderers (intentionally killing 3 or more victims) between 1958 and 1988 based on the work of Meloy and colleagues (2001). Although Hribal cannot be classified as a mass murderer at this time, this easily could have happened given the critical condition status of 4 of the victims. Some of the characteristics below are accompanied by my own editorial comments and may not necessarily reflect the thinking of Meloy and colleagues. 1. Most (70%) are described as loners. Peers may consider the person an outcast, which can cause and/or reinforce the loner status. When one is a loner, by definition, they are less attached to others around them. When one is less attached to those around them, emotional barriers are removed that would normally prevent seriously harming others. School officials must do a better job at identifying loners and trying to better socially engage them. 2. In 62% of cases, the adolescent was known to abuse substances, including alcohol, marijuana, cocaine, amphetamine, LSD, PCP, inhalants, and heroin. In my experience, this is often due to the adolescent using drugs as way to escape personal emotional pain. 3. In 59% of cases, there was some type of precipitating event (hours or days before the murder) that was significantly emotionally disturbing to the perpetrator or was obvious when reviewing the social history. Examples include but are not limited to a real or fantasized loss of a relationship with a girl, family dispute (see point X below), school suspension, bullying (see point X), or being fired from a job. 4. In 58% of cases, the adolescent made some type of threat regarding mass murder to a third party, usually days or months before the killings. 44% discussed murder with at least one person before the event. This is why it is important for parents to monitor their children’s social media accounts and to alert school officials about any alarming statements. 5. In 48% of cases, the adolescent was known to be preoccupied with war or weapons. Examples include but are not limited to owning a large amount of weapons, owning many materials related to violent themes, frequent trips to shooting ranges, grandiose fantasies about war and weapons, infatuation with Nazi regalia or street gangs, and idealization of fictionalized or non-fictionalized violent characters or people. 6. In 46% of cases, the adolescent had been arrested in the past and 42% had a history of violence against another personal, animal, or property. As of this time, Hribal is not known to have a violent past. 7. Many (43%) were bullied. Peers thus far interviewed have stated that they were not aware of Hribal being bulled. This does not mean he was not bullied, of course. Regardless, it is a reason why anti-bullying programs must continue in school. 8. Many (44%) were “fantasziers” in that they had a daily pre-occupation with fantasy games, books, or hobbies. Violent fantasies were common, which is why when I evaluate adolescents I look for these themes when discussing their interests. What kind of video games do they like (e.g., all first person shooters?)? What kind of books, TV shows, movies and music do they like? If they all center around violence, this could indicate a problem. Of course, the vast majority of adolescents who play fantasy games or violent video games do not become mass murderers but when this is combined with the other factors discussed, it increases cause for concern. 9. Many (37%) come from broken families where the parents are separated or divorced. This can result in anger, exposure to more family disputes (before or after the separation/divorce), decreased emotional attachment, and fewer adults present to detect when something is going awry with their child. Hribal is reported to come from a close family, however. 10. Weapon of choice: Most (85%) use a gun, with the most common caliber being .22. The most common shotgun gage was 12. Sharp weapons, such as knives and swords were used in some cases. Blunt objects, such as baseball bats and hammers have also been used. Adolescent mass murders usually bring about 2 to 3 weapons to commit the crime, most of which are taken from home or are purchased. This makes it all the more important for health care providers to assess for ease of access to firearms and for parents to make sure that their children do not have access to firearms. Some of the percentages listed above may be larger or smaller than presented because for some of the variables there was insufficient data to determine their presence for all adolescents. It is important not to focus only one of these factors in isolation. However, the more of these risk factors that are combined together, the greater the risk becomes and should be a cause for concern and mental health intervention. Predicting mass murder in adolescents will always remain a challenge, because it is a very low frequency event. Reference: Meloy JR1, Hempel AG, Mohandie K, Shiva AA, Gray BT. (2001). J Am Acad Child Adolesc Psychiatry. 40(6):719-28. Offender and offense characteristics of a nonrandom sample of adolescent mass murderers. One question I am often asked is “How can I obtain free copies of peer reviewed scientific journal articles if I do not have access to a medical school library or college/university library?” It is a very good question because the cost to download a single research paper in a scientific journal is often somewhere between $20 and $40. These costs are often set as a per article price, regardless of length. That is a lot to pay just to read a few pages, especially for health care providers in private practice or a layperson trying to learn more about a health condition affecting a loved one. Here are 10 ways to get free copies of research articles, some of which require more work than others. Feel free to post other methods in the comment section. 1. SEARCH PUBMED: PubMed is a free government-run website that contains an archive of over 23 million research citations. Simply type in a search term and click on one of the results. Sometimes, in the search results you will see the words “Free PMC article” or “Free Article” listed. Click on that and it will bring you to the abstract page where on the top right of the page you will see a button that indicates the free article status. Click on the button and the article downloads. 2. USE FREEMEDICAL JOURNALS.COM: Freemedicaljournals.com is a great resource provides an amazing compilation of access to free medical articles, including from some of the most well-respected journals. 3. USE HIGHWIRE: Highwire is another extensive collection of free online full text research articles. 4. SEARCH THE JOURNAL WEBSITE: Sometimes simply searching the journal’s website will show you that the article is available for free. Many journals, including the New England Journal of Medicine and the Journal of the American Medical Association highlight a few free articles a month for casual readers. 5. SEARCH PROFESSIONAL ORGANIZATIONAL WEBSITES: Many journals are published on behalf of a professional association. The name of the organization will be listed on the journal’s home page. For example, The Clinical Neuropsychologist is the journal for the American Academy of Clinical Neuropsychology (AACN). By going to the AACN homepage and searching for position papers, you will find an entire list of free articles available to you, such as here. 6. CONTACT THE AUTHOR: You can usually find the email address of a study author on the journal article page below the abstract, such as here. Simply send the author a request for a copy of the email and you will usually get a response with a copy very shortly as most researchers are happy to share their work. Can’t find the author’s email in the journal? Then just type the author’s name into a search engine and you can often find the author’s email address listed in the institutional directory of their employer. If no email is listed, try making a phone call to the author for such a request. 7. SEARCH ENGINE CHECK: Sometimes, just typing in the name of the article into a search engine will bring you to a free link that contains the pdf. You will be amazed at what you can find with a quick internet search. 8. JOIN A LISTSERV: Joining a listserv of health-care professionals in your field (such as here) is a great way to learn new things from colleagues. Simply post an email about a topic and an email is sent to all members of the listserv. Request that someone send you a copy of the article and someone is likely to have a copy and will send it to your privately. Listserv managers generally frown upon sending a copy of the article to the entire listserv unless it is already free in the public domain to prevent copyright violations. 9. USE SOCIAL MEDIA: Not a healthcare provider and don’t have access to a listserv? No problem. Join a social media site such as Facebook, Twitter, Google+, Google Groups, or Reddit and ask people interested in the same topic as you to send you a copy of the article if they have it. Again, the article should be sent privately if it is not in the public domain. 10. JOIN YOUR STATE LIBRARY: State libraries contain extensive access to journal articles that are typically not free elsewhere. All you need is a valid state library card, a login code, and you are all set. A good example is the extensive journal collection available at the New York State Library. 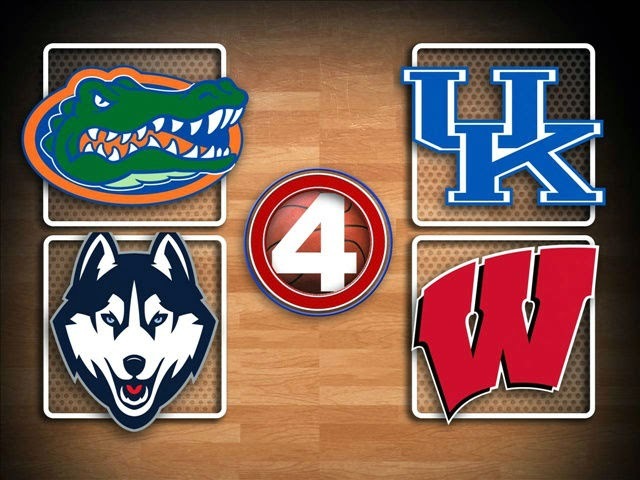 It’s Saturday night, the Final Four is here, and it is the best night of the year for college basketball fans. All of those preseason games, non-conference games, grueling conference games, conference tournament games, and NCAA tournament games eliminated all but 4 out of 351 Division 1 basketball teams vying for the national championship. Two of the teams in this year’s Final Four come from states where there is no professional basketball team: Connecticut and Kentucky. In these states in particular, basketball fans young and old rally around their team because it brings a sense of community. The players on these teams are treated almost like professional basketball players in their community by the fans. Florida and Wisconsin have their share of ardent young fans as well who follow their teams for state pride, because a relative went to one of the schools, or both. And then there are the children who are basketball fans of other college hoops teams who are staying up for the first game (6:09 pm EST start time) and all of part of the second game (8:49 pm EST start time). With all of these young children watching these games, Pfizer (the maker of Viagra) and TBS (the station that airs the Final Four) should show more restraint and avoid placing advertisements for erectile dysfunction (ED) during these games. That goes for other ED medication manufacturers as well. There is no need for any parent or other adult to have to answer questions from their children about what the adult terms and themes mean in these commercials. Sadly, this is nothing new. Democrat Congressman, Jim Moran, had complained in 2009 about these types of ads running in the daytime. He introduced a bill (H.R. 2175) to prevent the broadcasting of such ads between 6:00 am and 10:00 pm. I agree with him. The bill (known as the Families for ED Advertising Decency Act) advised the Federal Communications Commission (FCC) to treat such ads as indecent. The counter-argument is that Pfizer is targeting their ads during times when most men who suffer from ED would be watching. True, but they are also running the ads during a time when most men are probably watching the game with their children or grandchildren. There are many other times and venues (e.g., late night TV, adult-themed media) when men are watching and children should not be watching, where Pfizer can place such ads. So what ever happened to H.R. 2175? It died in the 111th Congress, likely due to powerful lobbying interests by the pharmaceutical industry. If you care about this issue, you can share this article with the social media buttons below and send this article to your Congressman or Senator and ask that one of them consider reintroducing the bill. I will be doing so as soon as this blog entry is published.